Stargazer Ceilings – The Best Way to Sleep under the Stars Every Night. Imagine going to bed under a canopy of stars – every night. Imagine how calming, soothing and relaxing that is after a hectic day. Imagine how exciting this is for children! They would actually look forward to going to bed! And they will remember their magical stars for the rest of their lives. Well, you no longer have to imagine……. 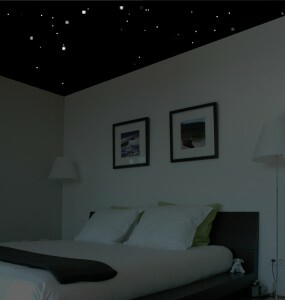 You can now have an illusion of the night sky on your bedroom ceiling! Stargazer Ceilings give you an accurate depiction of the sky as it was on any particular night. For your children you can have the night sky for the the day on which they were born. If you have an interest in history you can have a depiction of the stars as they would have looked at that time – maybe the Battle of Trafalgar? Your wedding day perhaps….. Imagine lying in your bedroom and looking up at a clear night sky – every night! A Stargazer Ceiling gives the illusion of the roof having been removed from your house and you are staring up at hundreds of twinkling stars in a clear night-time sky. The result is virtually invisible during the day but at night when the curtains are drawn and the room is dark the ceiling literally comes to life! But don’t settle for less. If you have stars on your ceiling make sure they are accurate. All Stargazer Ceilings use paint that will glow comfortably for 10 hours or more. We use high quality paint that is 10 times brighter, last 10 times longer (and unfortunately costs 10 times more to produce) than many other fluorescent paints. But then we don’t settle for second best. A Stargazer Ceiling is virtually invisible in the day and won’t spoil your decor! 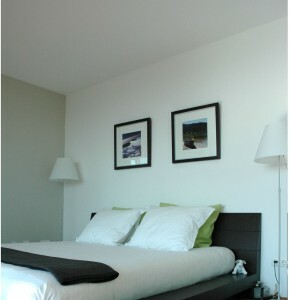 Daytime bedroom – stars completely invisible At night the stars come out! So what will you get from a Stargazer Ceiling? A little bird has told me that even Brooklyn Beckham had a starscape on his bedroom ceiling!! Just one word of warning….. When your friends know about your Stargazer Ceiling – you are going to get lots of people asking to see your bedroom at night! We can create an accurate representation of the sky at night in your bedroom or snooze room, or how about a fantasy scene in the nursery or children’s room? During the day the room looks normal. However, when it is dark, the ceiling dissolves away as the stars (or your fantasy theme) magically begin to shine. You will see glowing stars, constellations and even the Milky Way. But, hey, why stop there? How about adding another dimension to your garden? Yes, our special paints are suitable for outdoor use too!! !